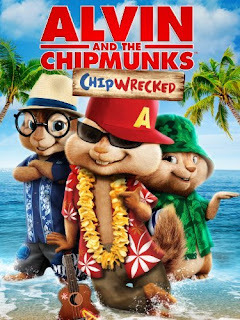 We had a movie day over the weekend and one of the movies we watched was Alvin and the Chipmunks: Chipwrecked! I have always loved the Chipmunks, and have fond memories of them. My eleven year old son was joking around and said, "Wow, the Chipmunks sure do sing a lot of popular songs!" My eight year old daughter's immediate response was, "Of course they do! They are famous singers, don't you know!" 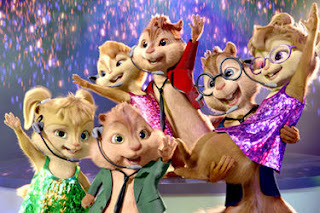 Alvin and the Chipmunks: Chipwrecked was fun and cute! I loved the tropical island setting and the music was so fun! For me, the music was the best part, I loved it! I think the Chipmunks sing some of them better than the original artists! The movie relayed a very important message: You can have fun, but it is important to know when to be silly and when to be serious! Of course, there are consequences for every action you make, even if it is all in good fun. It was fun to see Simon acting a silly and Alvin stepping up to the plate! Since watching the movie, my daughter has asked to watch it every day since. I think Alvin and the Chipmunks: Chipwrecked may be her new favorite movie, although that could change at any moment.